Are you looking for a modern twist to your room? This dark brown handmade wooden wall clock will stand out in a minimalistic, Scandinavian style interior and compliment an Art Deco style room. The ancient Roman dial that is engraved in a 3D effect makes this timepiece unique as it joins the new and old eras. If you are looking for versatility and unlimited options, this wall clock is a perfect choice. This wall clock lets you see all the layers of a tree. You can’t go for a more natural look than this one. This timepiece will be suitable for a living room, bedroom or any cozy area at your house. If you enjoy a minimalistic design with a rustic vibe, this wooden clock is exactly what you need. This wooden clock is a for someone who likes to keep things simple. It would fit great for a kitchen or a corridor with clean an minimalistic design. This clock will provide a sustained level of accuracy and reliability and it won’t make a sound with its silent motion. A practical choice that will serve as a great timepiece. This custom made world time zone wall clock is crafted of hardwood and plays a vital role in improving a room’s ambiance. Follow the time from different parts of the world of your choosing. It will fit perfectly in an international companies office. This wall clock is an elegant and discrete, yet unusual timepiece that will add a wow factor to any space. This Modern style wall clock will add a fresh touch to your decor. The reclaimed wood base is hand painted half white, leaving the other half unfinished. The simplicity and minimalistic touch will fit perfectly for an interior that needs something light and modest. This nordic star shaped wall clock will bring a post-modern style to your interior. The colorful design will bring new feelings to home decoration. It has a quiet watch movement, metal indicators and non-toxic, environmentally friendly surface. Fits for smooth surfaces: a living room or a hotel lobby main wall. This continental style wall clock will look good in your cabinet. It is simple and classic and shows accurate time. It can serve as a decoration that won’t take away from the interior - just add a touch of elegance. Most of the hardware is not made from wood, but the wooden frame is enough to give the presence of nature. Are you looking for elegant handcrafted wooden wall clocks? Design your own in modern or rustic style. It is completely up to you. If there’s something unique running in your mind, you can add your own touches to it to transform your imagination into reality. It can be your company logo, a custom design or a special engraving. A great gift for your business partners and friends. They are made from 100% natural wood and can give your place a new, refreshing look. This rustic style wooden clock will look good, if you want to achieve a vintage vibe in your interior. The barnwood backing gives it that countryside feel for the weekend getaway. It has large roman numerals on its dial cut from black-painted metal, black metal framing, and a wooden back. This wooden clock will add a rustic touch to your home. It is handcrafted from start to finish. The roman numerals are hand-painted a flat black. This clock will be suited for the bedroom, kitchen and dining and entryway. 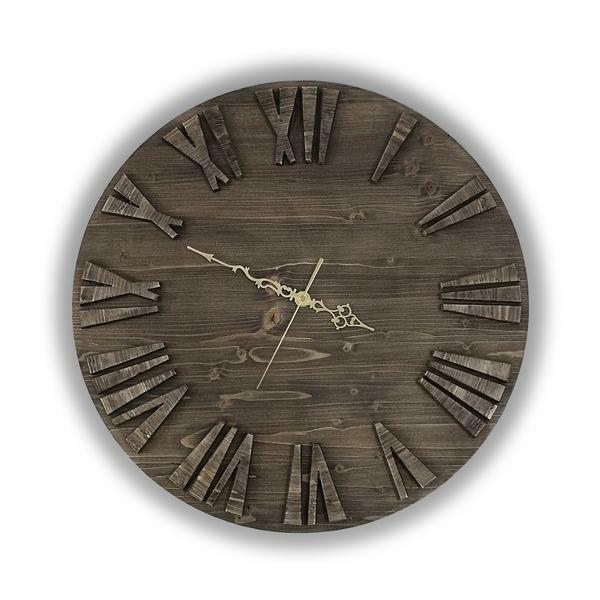 If you are going for a layback, cottage style interior, this wall clock will fit greatly.